I know in this season of Easter, it seems like going backwards to hear this text that I’m about to read from the gospel of John. After all, it took place before the crucifixion and the resurrection. Still, every fourth Sunday of Easter we get a nod to at least a part of John’s tenth chapter along with that great Psalm of the Lord as our Shepherd, with us each step. We have no need to want. Good Shepherd Sunday it’s been nicknamed by preachers who probably have grown a little bored with going back to it every year. But maybe, just maybe, at this point a few weeks after the resurrection, we need the reminder. . . . So, listen for God’s word to us in a reading of John 10:11-18. These are words recorded to be on the lips of Jesus. Listen. This is the word of God, for the people of God. Thanks be to God! Some of you may know better than me that there are different ways to herd animals. Think about cattle. You don’t go out in front of cattle hoping they will follow. Cattle are driven – from behind. Poked and prodded to get them to move from this patch of grass or to that river of water. I’ve actually seen it on a trip to Honduras with Heifer International to learn all about the ways training and livestock are making significant differences in the lives of whole communities. . . . Some of you’ve met my puppy and it’s been great fun watching him do that whole Alpha dance. That’s the thing with dogs. They have that pack mentality and need to know which one is in charge: the Alpha. Once established, the Betas all fall in line behind. . . . I’ve heard of a training course on moving horses. Whole companies are getting their leaders to go through it. Because, supposedly, if you get still enough; centered enough in yourself with total calm in your body, mind, and spirit, supposedly you can get the massive beast of a horse to move alongside you where ever you go. As long as you keep centered – no pushing, no pulling, just intently moving forward. Step by step the horse will walk with you. Amazing! . . . For you cat lovers out there who know how much they have a mind of their own, I once met a man who told me his four cats cuddle close as he has near amazing sway over them. I mean, let’s face it: anyone who can herd a bunch of cats has to have a VERY special knack, right? And then there’s sheep. Sheep are herded from the front (Feasting on the Word, Yr. B, Vol. 2, Nancy R. Blakely, p. 450). Did you know that? Sheep literally learn the voice of their shepherd and then follow where ever their shepherd leads them to go. Out in front, the shepherd will take the flock to green pastures for grazing. And to still waters for the drink of refreshment. The shepherd calls: “Come!” And the sheep come – one after another and all in a bunch. Supposedly sheep even have the capacity to recognize the face of their shepherd. And over time, sheep can be taught to respond to their own names – kind like we humans can (www.sheep101.info/history.html). It’s not really that the sheep trust. They just follow where ever the shepherd leads them to go. Which, of course, can be dangerous if they don’t have a well-meaning shepherd. . . . We hear often that sheep are considered dumb or mindless. And left on their own, the sheep will wander where ever. Even into all kinds of trouble. But if you ask me, sheep are kinda brilliant: following when led by the shepherd from the front. Because rest assured when trouble arises, like a ready-to-strike snake, or a hungry wolf in the middle of the path – the sheep have added protection. First you gotta take out the shepherd before you can get at the sheep. Protected in front like that, no matter where the shepherd leads, together the sheep always are gonna be okay. Shepherding is one of the oldest professions. Because sheep were one of the first animals domesticated due to their natural ability to follow. One source claims that sheep were the first commodity spawning trade between peoples. The source of international relations because somewhere around 3,500 B.C.E., the production of wool became one of humankind’s most ancient, highly-sought achievements (www.sheep101.info/history.html). Back before we put up fences around our own property to keep in what we wanted in and out what we wanted out; sheep had to have a shepherd to keep them from harm’s way. The flock had to be moved by the shepherd from one place to the next to ensure sources of food and water. And in places like the Middle East where Jesus lived, rocky terrain and arid deserts made the work of shepherds incredibly important to the survival of the sheep. We know that sheep were invaluable to the ancient Israelite enterprise. It’s part of why the Old Testament is filled with all sorts of ancestors in the faith who at some point in time literally were shepherds of sheep. Sheep provided milk, and cheese, and wool. When slaughtered they provided hides and, of course, meat. . . . Remember too that sheep were one of the most important sacrifices in Judaism: a costly offering to lift up to God. Every year a Jewish family was to remember the Passover when God freed the people from Egyptian enslavement. Jerusalem even had a gate called the Sheep’s Gate, through which sheep would be led right into the Temple for the annual blood offering. . . . We’re not that far from Good Friday and Easter morn. So that you see the parallels. Jesus becomes the sacrificed lamb. Once and for all, the offering is made. Freedom from all that would enslave is accomplished. However: Jesus doesn’t refer to himself as a sheep here in the gospel of John. Rather, Jesus embraces for himself that traditional metaphor for God from the Israelites beloved sacred Psalms. “I am the good Shepherd,” Jesus proclaims – not just to anyone who will listen; but to some Pharisees of the Jewish people who drove out a recently-healed-by-Jesus blind man (John 9:34). That’s what happened right before chapter 10 of John. In the presence of those who would not properly care for one of God’s suffering children, Jesus declares himself the kind of shepherd that readily protects the sheep. The model shepherd. The pattern of how a shepherd should be. You see, Jesus senses what is going on. He knows that some sort of threat is upon the sheep. A ravenous beast is breathing down their vulnerable necks. No one seems to care that the man born blind from birth finally can see! His own parents are too afraid to speak out (John 9:21). Jesus is the good Shepherd. He hears the cry of his one little precious sheep. He will risk the loss of his own life if that’s what it takes to make that sheep well. Standing between this newly-sighted child of God and the religious leaders whose anger burns hotter each day, Jesus will protect at all costs. His deep love for the one in need will put him in harm’s way so no ill will come upon the one he just has healed. If Jesus is the good shepherd, then like the newly-sighted man, we are the sheep – known members of his treasured flock – unless we’re busy being like those who ignore the cry of ones in need, or even become the threat to all the rest. . . . Every year the fourth Sunday of Easter brings us to this gospel text. I know many of us have romanticized visions of the LORD, our Good Shepherd. Psalm 23 is by far the favorite of more Christians than almost any other biblical text. . . . And in the good Shepherd, we see one out in front of us calling us to come – herding us to follow to where he needs us to go. One flock listening to the sound of his voice – moving at the recognition of his face. Being kept safe together by a good shepherd who cares so very deeply for us. Isn’t that beautiful? A message we need to hear especially after resurrection when disciples might be wondering where in the world he is. He’s not going to run away at the first sign of trouble. He’s not going to jump out from the front of the pack when the hungry wolf pounces upon the path. He’s sticking right there so that nothing can get at us. Like a momma bear ready to roar and swat so her little cubs won’t be hurt, the good shepherd defends his flock. . . . It’s that same natural instinct that causes him to call us forward as well. Because he knows us. . . . When we’re honest we can admit that all too often, left to our own devices, we sheep will nibble and nibble at one patch until there’s nothing left for us there to eat, right? We’d strip the soil bare and keep right on eating the dust of dirt if it wasn’t for the good shepherd who leads us to new places to be nourished; fresh pastures where we can be fed. Refreshing waters that will quench our thirsty souls. . . . Thank God for our good shepherd – out in front: protecting, providing, willingly becoming the lamb to the slaughter if he must that we might be spared any harm. For our part, as the Risen Christ’s sheep, we must learn to listen, then follow at the sound of his voice. We know all sorts of other voices are ready to tell us which way we should go. “Over here,” they whisper. “This way,” they beckon. Not always down paths that seem so bad. But certainly away from the ways the good shepherd needs for us to go. . . . For us today, listening for his voice means knowing him. Learning who Christ was and how he lived his life. Where he would go and call us to come follow. Discerning when we see the face of the Risen Christ at work among us today. For through us, with the Holy Spirit in us, the Risen Christ lives yet today! . . . 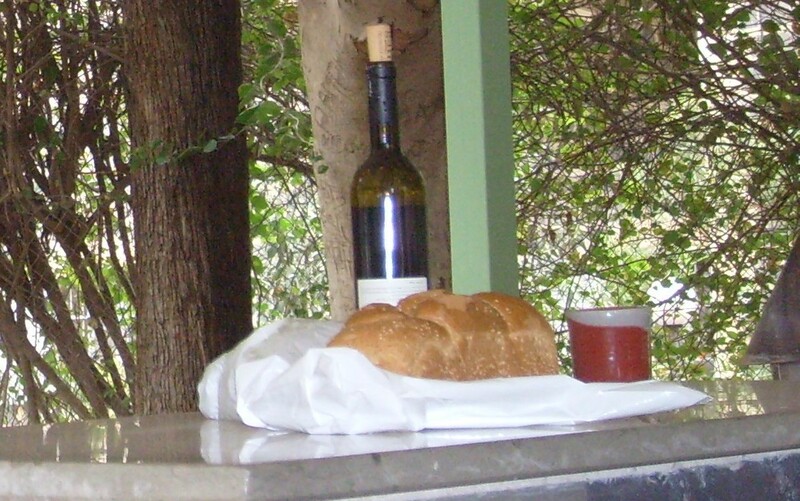 Remember in that parable from Matthew’s gospel when he said feed and give drink to those who hunger and thirst? Welcome the stranger and truly bring them in. Clothe those vulnerable to the elements. Comfort the sick and be with those locked away in any kind of prison (Mt. 25:31-46). Then, indeed, we are face to face with the Risen Christ. . . . Listening for the good shepherd’s voice will get us to where we need to be – individually and collectively as his church. It’s part of what the session of this church continues to seek. The voice of the good shepherd calling this congregation forward. Forward. Forward to the future which the good shepherd has in store for this church. Following the one who walks out in front, protecting, seeking to provide. . . . Until we are left affirming: “the LORD is our good Shepherd! Surely all the days of our lives, and forever, we shall dwell in the midst of our God! This entry was posted in Sermons and tagged 26 April 2015 sermon, Fourth Sunday of Easter sermon, herding animals, Jesus the Good Shepherd, John 10:11-18 sermon, Psalm 23, Sheep, The Good Shepherd on April 28, 2015 by RevJule.